I've been wanting to switch up the bases of my desk/sewing table for a little while now. They just weren't that functional. I thought they would be when we first bought them, but I've really missed having drawers. We actually sold my desk that I made out of door a little while ago, so this is the only desk in the room now. I loved that desk, but we just didn't need it and if we end up moving we didn't want to have to move it. I'm on a bit of a "get rid of everything" spree right now. 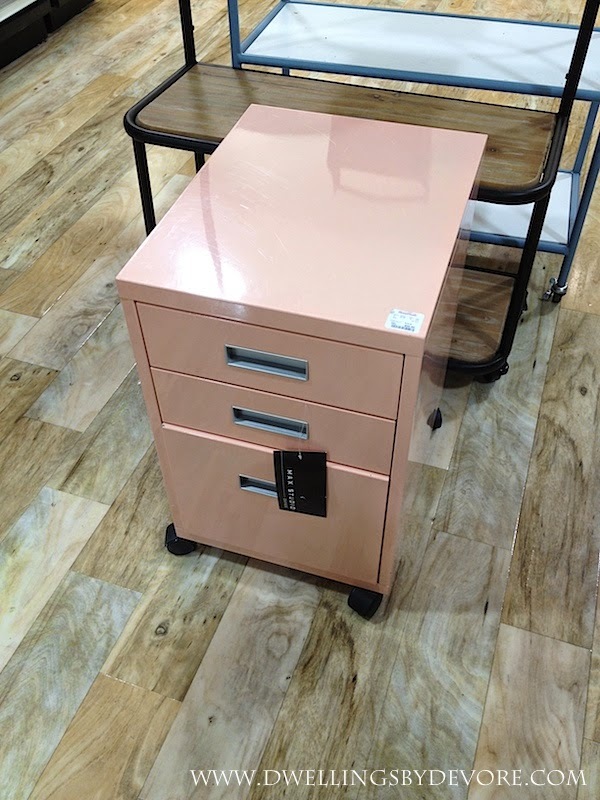 Anyways, I was looking for new bases and I knew I wanted something like a filing cabinet so that we could use it for important documents and then use the other drawers for storage. I loved this one that I found at Homegoods. Isn't it the prettiest shade of pink? But they only had one and the price was a little steep, at least for me. Then a few weeks later I came across this pair at a yard sale. I originally wanted something metal, but I knew I would regret passing these up, especially for the price. They were part of one of those awkward corner desks and thankfully the guy sold me just the bases. 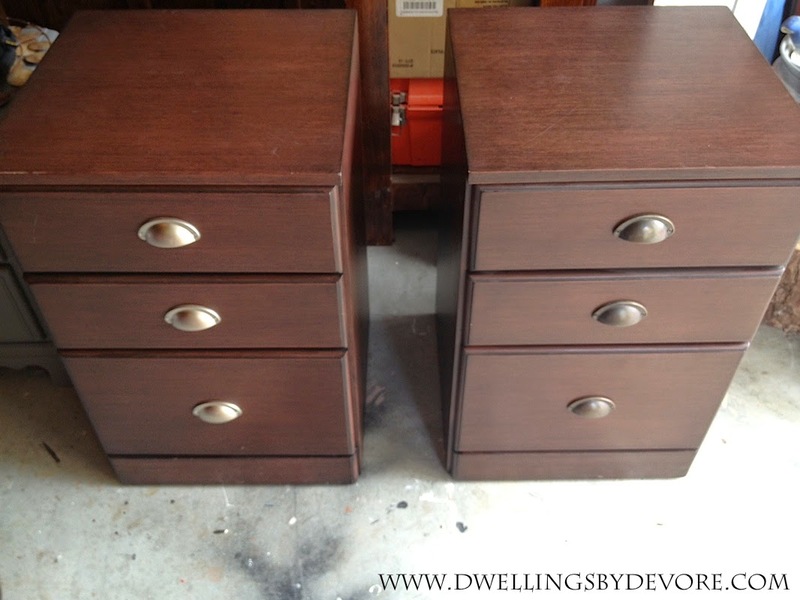 The bottom drawers on both have the option to hold hanging files and then the top two drawers are just extra storage. They look like wood, but they are actually a laminate material like most generic office furniture. 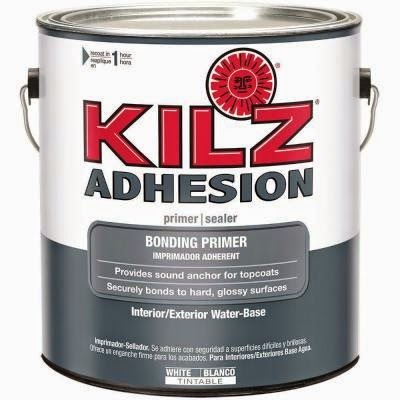 I wasn't sure how to go about painting them, but then Kilz sent me this awesome Adhesion Bonding Primer that will stick to just about anything. I was excited to give it a try. I must say I was pleasantly surprised with how well it adhered to the laminate. I didn't even sand before I got started. I just gave them a good wipe down. Then, I used a foam roller to apply it and it worked great. I did two coats of primer and then followed up with two coats of semi gloss white paint. The cup pulls were actually different on the two bases, you can kind of tell in the before picture. I thought that was odd, but I didn't mind because I knew I wanted them to be gold anyway. 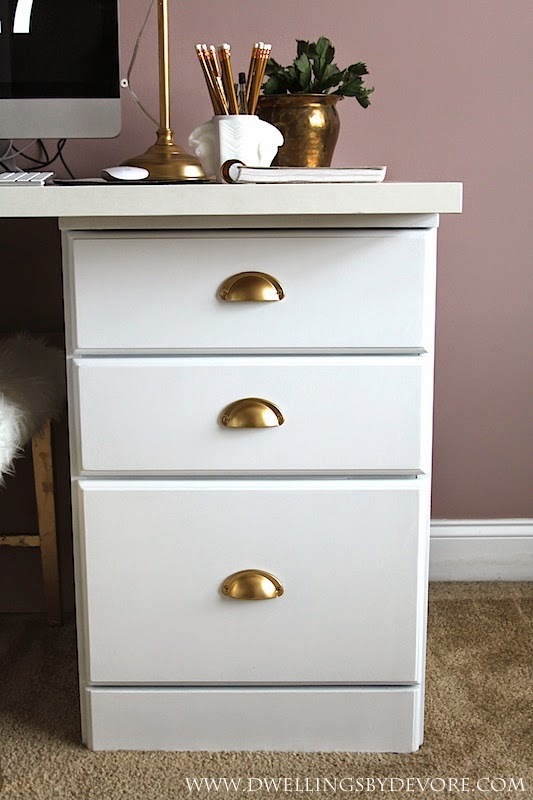 I gave them a few light coats of Rustoleum Gold Metallic Spray Paint. I'm already loving having so much more storage than before! Now I just need to find a narrow office chair that will fit between the bases. 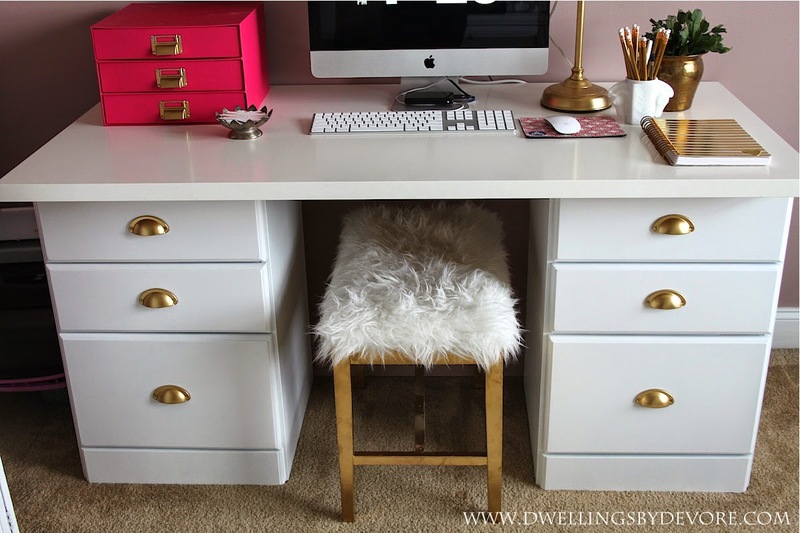 I'm thinking a ghost chair like this one might be the perfect solution! oh it looks perfect! i am sad for your door desk, but i know how important drawers are! can't live without them! YES!! I'm obsessed with that primer! We bumped the wall pretty hard when moving our dresser upstairs and no mark! I love how bright and fresh the cabinets now are! Looks awesome!!! 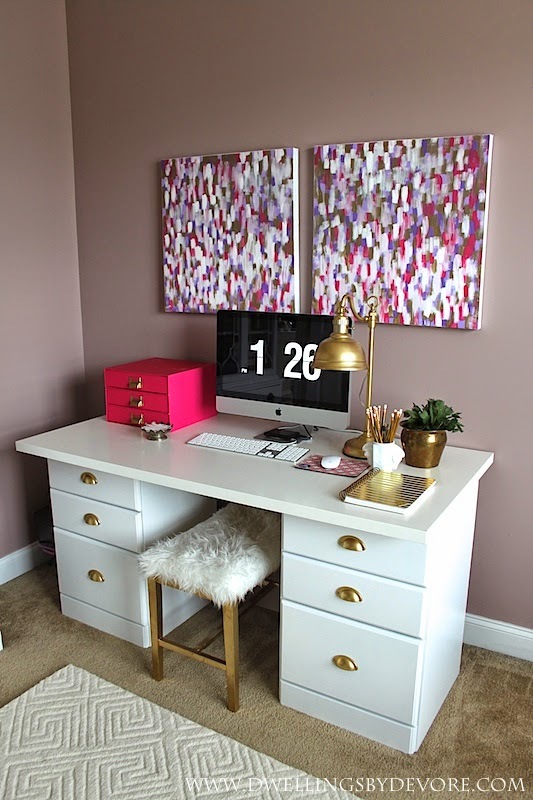 I need a desk too and I'm hoping to find some great filing cabinets too. Great job!!! 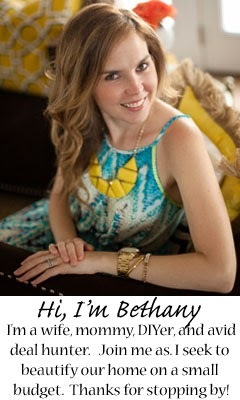 Fabulous job Bethany!!!!!! LOVE IT! I love this! And you explained everything so nicely. This looks great Bethany, I've got a few laminate pieces I need to paint! Pinned! Thanks Rachel! I'm pretty excited about all the storage too! Oh good! It worked really well for me, I think you will love it! Thanks Sarah! It really is a great product! I love the way the trunk turned out that you used it on! 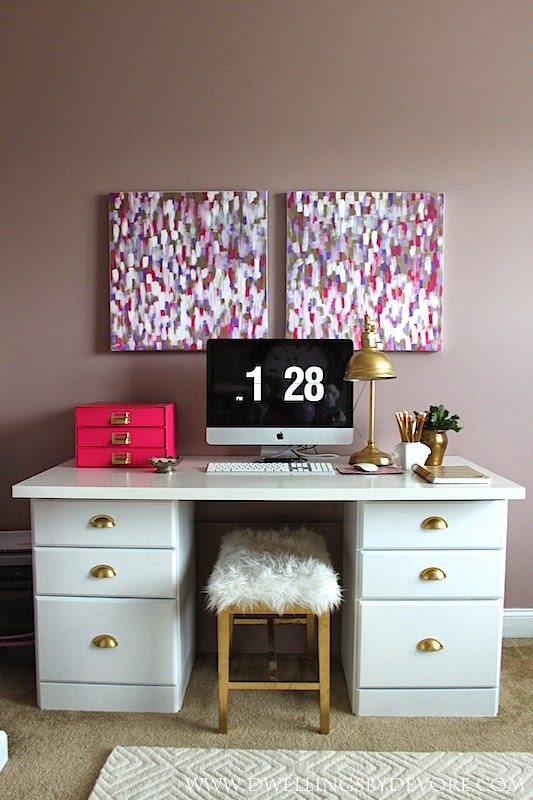 That desk looks great, but what I'm really in love with are those darling canvases above it! Where oh where are they from? Are they DIYs? They're lovely! Love this!! Did you use a protective coating on the top? It looks awfully shined and fabulous! I actually just used semi gloss paint so I could skip the top coat. I always have trouble getting a top coat not to yellow on white paint. So far it has held up great! 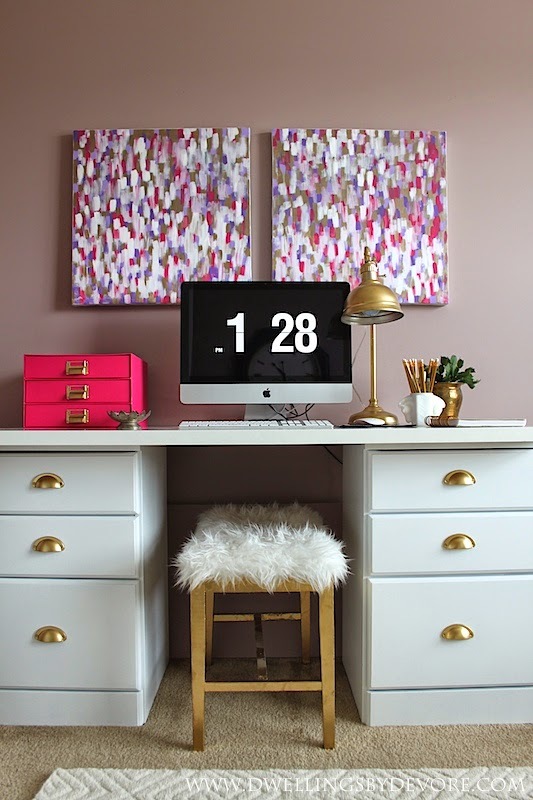 Where did you get that gorgeous gold lamp on your desk? That is exactly what I am looking for, but having a difficult time finding that. I actually found it at Goodwill and gave it a little facelift with gold spray paint, but I've seen similar ones from time to time at Homegoods. Hope you come across one soon! Hi, the desk looks GREAT! What are you using as the top? Where did you source that? Thanks so much! The top is from IKEA. I can't seem to find it online, but you can buy just the desk top at the store. Quick Question: What did you use to adhere the top to the two pieces? Or is it just set upon them? I just set it on top of the base so I can switch it up down the road if I change my mind.